This is an off Crossover with DOCTOR WHO and an Infinities version of the Star Wars universe where Anakin made a completly different choice on Revenge of the Sith... This takes place at 0ABY, the same year that would normally be A New Hope.. This version of the Doctor (And the Time Lords, for that matter) are from the SW galaxy, and has no connection with the series versions, but is based on the 10th Doctor, (David Tennat) He currently has no companion.. Interesting idea - will you be reinventing the time lords culture to fit in with the sw universe and what will the tardis look like in this universe? * Beware the fury of a patient man. * What's the point in being alive if you're not living? The Tartis looks like a Jedi Starfighter, but instead of a cockpit when you open it up,it opens into a staircase ... lol.. I like the Idea behind the starfighter, but im gonna keep a few things standard.. 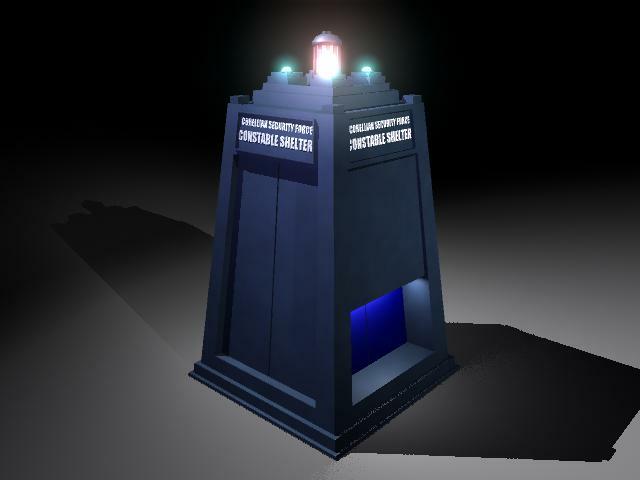 THe Doctors TARDIS is shaped like a Corellian CORSEC Street shelter, (ie: Police Box) Ill post up a image of it on my Devient arts site of it. It is, of course, broken. THe Time Lords are not know to the galaxy at large. THe Jedi Council are fully aware of the Time Lords, mainly in the form of the Doctor. if there was an analog for the Series, the Jedi would almost take up the roll that UNIT plays. The last time that the Doctor was seen by the Jedi Council, however, it was the Ninth Doctor, the one in this story is the Tenth..
Each of the Chancelors are told of the Time Lords existance, when their elected. However,The outgoing Chancellors seem to forget about the existance of the Time Lords, or they never speak of them again. Here is some more information on this Infinities thread... This time line will still have the BBY (Before Battle of Yavin) tag, since it is the most well known timekeeping in the Exodus galaxy..
Chancellor Palpatine was taken into custody by Mace Windu, Anakin Skywalker and a man calling himself the Doctor, after it was proven that he had been the Sith Lord, Darth Sideous. It was disclosed shortly afterward that Skywalker had broken the oath of the Jedi, by marrying the Senator from Naboo and was indeed the father of her unborn children. In an unexpected move, the Jedi Council allowed Skywalker to remain in the order, and keep the family that he had started. After this, it was discovered that many Jedi Knights had secret families and offspring.. The Jedi Council decided to lift the ban on personal relationships, on a case by case basis. In a unanimous decision, those who chose to seek to begin a family would be banned from teaching their offspring. Those Jedi who had families were permanently stationed on planets where they could raise their children in relative security. Senator Alder Nos’tuss from Bothawai is named Chancellor of the Republic by unanimous vote, as those who had supported Palpatine felt it best to keep quiet..
Former Chancellor Palpatine is sentenced to Life without the Possibility of Consciousness, and held in an unknown location. The war between the Separatists is still waging, with no end in sight, even after the eliminations of Count Dooku and Grievous. Another head of the Confederation of Independent Systems has arisen, who was only known by the name the Master. It was said that this Master was working closely with the former Chancellor, Palpatine. Kashyyyk is attacked by the Confederation in an unrelenting assault, attempting to reclaim the Navigational Hub. The Wookie home world was still recovering from the attack only a year prior. Jedi Knights Kento and Mallie Marek, who were permanently assigned to the world, are killed in the attack, leaving behind an only child, Galen. Jedi Masters Anakin Skywalker, Rahm Kota and the Doctor, in a daring raid, are able to destroy the lead vessel. The Doctor would be see throughout the span of the Clone Wars.. The republic begin to recruit from the general populace of the Republic, to bolster the be leaguered clone army. It was disclosed that the Cloners from Kamino had suffered a Cataclysmic error in their Genetic batch, as clones were being created with genetic defects. They had no choice but to stop production. It was later discovered that this was brought on by an act of Sabotage ordered by the Separatists leader, the Master..
the Clone war’s end. With Heavy losses on both sides, including a large bulk of the Jedi Order, leaving it only at 25 percent strength to protect the Republic. The Clone Army is likewise depleted, leaving only thirty percent of the Republic Army being clones. After the war, the Republic Army was downsized, retaining the remaining Clones that wished to remain in the Armed Forces, and giving them the option to retire. After a impassioned speech by the Doctor, All clones were given full Citizenship, an apparent oversight in the past that they had not been automatically given this right. The leader of the Confederation, the mysterious Master, was never apprehended. THe Jedi Order takes another blow when Jedi hailing from Corellia break, and form the Order of the Five Brothers, or more simply Corellian Jedi. In their charter, they will concentrate on matters that directly affect Corellia and its interests. The Corellian Order only takes Force Sensitive’s who are from the Corellian system. the Planet Agramar are invaded by the Cybermen, and held the world for several weeks before the Republic Forces could come and liberate the system. It was discovered that the Cybermen had used the general population to get the genetic stock to build their forces in those weeks, which by the time the Republic arrived; their numbers were in the tens of thousands. The conflict lasted mor than a week, with no apparent resolution. It wasn’t until the Cyberking was destroyed that the conflict ended, as it was assumed that the Doctor perished with the Cyberking. The Jedi Council, with the Blessings of the Senate, begin to recruit heavily into the order, and Accelerate training for Padawans. Bail Organa of Alderaan is elected Chancellor of the Republic..
Last edited by zephre on Mon Sep 28, 2009 7:27 pm, edited 1 time in total. Well, I just put up what was happening to Luke, Raisa and the Doctor on a new Thread.. THis thread is currently just a story thread, and is currently closed. If any one has an overwhelming interest in adding to this story, please send me a PM before todding anything into "The New Hope"
You can read Chapter Three.. here. Chapter Five of the Lords of Gallifrey: A New Hope is about to get underway, and so far, it has followed somewhat closely the events in the Origional New Hope, but from here out, it will make some definate alternate route. I hope your all enjoying it so far.. I was considering creating a Wikki for all of this.. Opinions?